The Kiev Caves Icon of the Dormition of the Most Holy Theotokos (May 3) is one of the most ancient icons in the Russian Orthodox Church. The Mother of God entrusted it to four Byzantine architects, who in 1073 brought the icon to Sts Anthony and Theodosius of the Caves. The architects arrived at the monks' cave and asked, "Where do you want to build the church?" The saints answered, "Go, the Lord will point out the place." "How is it that you, who are about to die, have still not designated the place?" the architects wondered. "And they gave us much gold." Then the monks summoned all the brethren and they began to question the Greeks, saying, "Tell us the truth. Who sent you, and how did you end up here?" The architects answered, "One day, when each of us was asleep in his own home, handsome youths came to us at sunrise, and said, 'The Queen summons you to Blachernae.' We all arrived at the same time and, questioning one another we learned that each of us had heard this command of the Queen, and that the youths had come to each of us. Finally, we beheld the Queen of Heaven with a multitude of warriors. 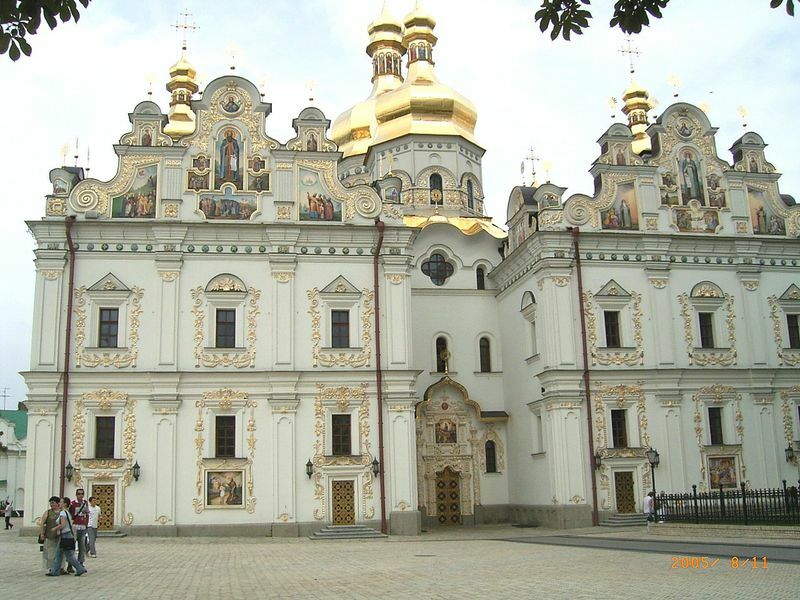 We bowed down to Her, and She said, 'I want to build Myself a Church in Rus, at Kiev, and so I ask you to do this. Take enough gold for three years.'" "We bowed down and asked, 'Lady Queen! You are sending us to a foreign land. To whom are we sent?' She answered, 'I send you to the monks Anthony and Theodosius.'" "We wondered, 'Why then, Lady, do You give us gold for three years? Tell us that which concerns us, what we shall eat and what we shall drink, and tell us also what You know about it.'" "The Queen replied, 'Anthony will merely give the blessing, then depart from this world to eternal repose. The other one, Theodosius, will follow him after two years. Therefore, take enough gold. Moreover, no one can do what I shall do to honor you. I shall give you what eye has not seen, what ear has not heard, and what has not entered into the heart of man (1 Cor. 2:9). I, Myself, shall come to look upon the church and I shall dwell within it.'" "She also gave us relics of the holy martyrs Menignus, Polyeuctus, Leontius, Acacius, Arethas, James, and Theodore, saying, 'Place these within the foundation.' We took more than enough gold, and She said, 'Come out and see the resplendant church.' We went out and saw a church in the air. Coming inside again, we bowed down and said, 'Lady Queen, what will be the name of the church?'" "She answered, 'I wish to call it by My own name.' We did not dare to ask what Her name was, but She said again, 'It will be the Church of the Mother of God.' After giving us this icon, She said, 'This will be placed within.' We bowed down to Her and went to our own homes, taking with us the icon we received from the hands of the Queen." After hearing this account, everyone glorified God, and St Anthony said, "My children, we never left this place. Those handsome youths summoning you were holy angels, and the Queen in Blachernae was the Most Holy Theotokos. As for those who appeared to be us, and the gold they gave you, the Lord only knows how He deigned to do this with His servants. Blessed be your arrival! You are in good company: the venerable icon of the Lady." For three days St Anthony prayed that the Lord would show him the place for the church. When he attempted to kiss the icon, he was not able to come near it. He went to the doors and suddenly shouted, "Sts Anthony and Theodosius! Let me not be struck down for my dishonesty. Entreat the Most Holy Theotokos to drive away the multitude of demons which torment me. Let the gold and silver be taken away. It is sealed up in my granary." 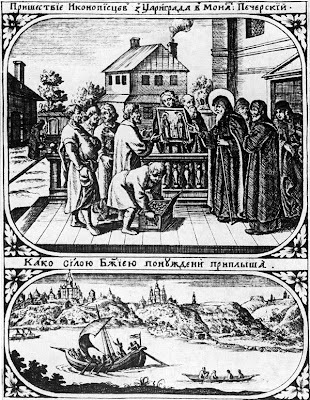 Zachariah gave away all his inheritance to the Caves monastery, where he also himself was tonsured a monk. 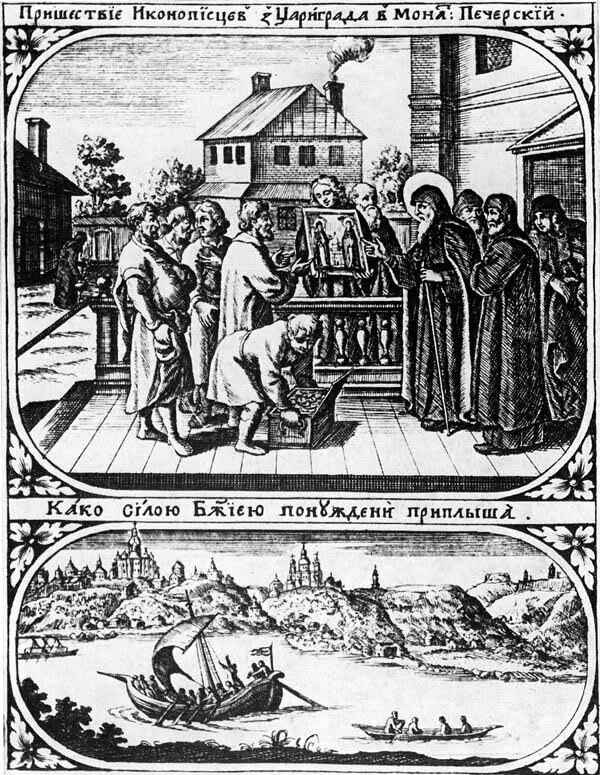 From that time, no one would take oaths before the wonderworking icon (March 24).